Brian Halderman, LMSW has served on the core team since 2013, but has been active with the peaceCENTER since coming to San Antonio in 2008. Passionate about building an inclusive and compassionate San Antonio, Brian has a strong interest in supporting social justice and community engagement activities in our community. 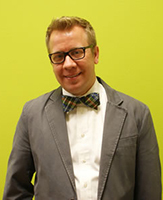 An active supporter of LGBT rights, particularly within the Catholic community, Brian was a member of the LGBTA Spiritual and Religious Leaders group convened by the LGBT Community Center of Greater Cleveland and assisted in the development of the Gay and Lesbian Family Ministry of the Catholic Diocese of Cleveland in early 2000s. Locally he supports the work of Pride Center San Antonio. Active with the Death Penalty abolition movement, Brian is a past board member of the Journey of Hope…From Violence to Healing, a murder victim family member organization that seeks alternatives to the death penalty and the 2012 recipient of the Texas Coalition to Abolish the Death Penalty’s Appreciation Award. His full-time work is as the Program Director of the Center for Civic Engagement at The University of Texas at San Antonio where he oversees service-learning, civic literacy and skill development all in an effort to enhance the scholarship of engagement at UTSA. Previously Brian served as the University Minister for Social Justice at St. Mary’s University from 2008-2013, where he remains an adjunct faculty member in the department of Sociology. A native of Northern Kentucky, he is a graduate of the University of Dayton where he earned a BA in Religious Studies. As a licensed social worker, he holds Masters in Social Work from Washington University in Saint Louis where he focused his studies on social and economic development. Visioning a Compassionate San Antonio: in four minutes!